After a near 40% increase in price over the last 45 days bitcoin looks to be slowing down, at least in the short term. As with any sharp move like the one bitcoin has experienced, there will be a pullback at some point. Traders continue to feel bullish however, as evidenced by futures contracts on OKCoin. September contracts spiked to over $615 at open, then slightly pulled back to just over $600 (17:00 GMT) where they currently sit. Even with market fundamentals exerting pressure for a pullback, two things are likely keeping bitcoin at the current $580 level. First, the halving of the miner reward likely coming before the end of July this year will continue to enthuse traders who Indoor Bounce House For Toddlers buy into the value of increasing scarcity. It can certainly be argued that the halving event is already priced in, but with so little historical data to go on it should not be relied upon. Second, such a large spike in prices has brought in casual investors and day traders alike. Buying at the crest is always possible with moves like this, so traders should not be surprised to see price spikes occur. RSI has finally calmed down to under 50 after spiking above 70 several times recently, as shown on the 5 day TradingView graph below. This indicates a consolidation, which is exactly what has been seen for the past 3 days. 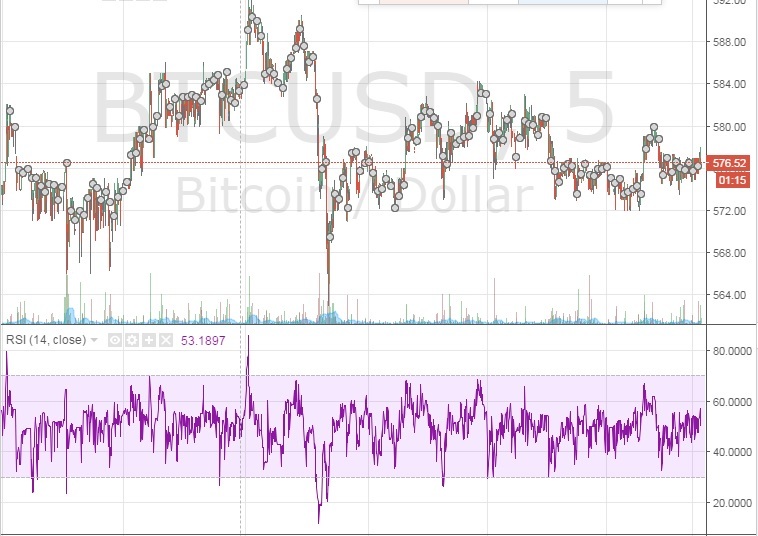 Traders can watch for RSI to drop under 30 to indicate oversold conditions, which is certainly a possibility if mass profit taking ensues. Notice in particular the one dip below 30 in the chart below resulted in a near immediate move from $569 back to $580. Volume has fallen from over 1.5 million to under 1 million this week, indicating a weakening in buying power and demand. Without the aforementioned catalysts keeping bitcoin at the current $580 level a pullback would likely have already begun. Traders can look at the $535 and $500 levels as previous support if the correction begins to take place.